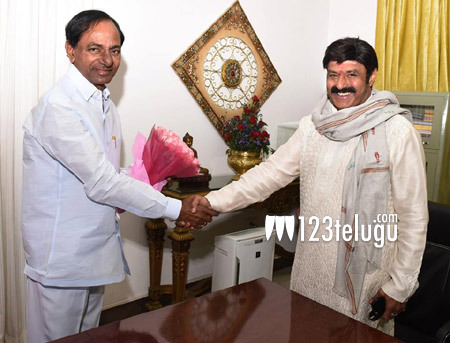 Balayya reveals 100th film news to KCR? Over the past few months, Nandamuri fans and media circles have been eagerly awaiting the news regarding Nandamuri Balakrishna’s prestigious 100th film. Earlier, there were reports that Balayya was in talks with his Simha and Legend director Boyapati Srinu and the Aditya 369 director Singeetam Srinivasarao. However, Balayya did not confirm anything concretely in his promotional interviews for his Sankranthi hit, Dictator, making things even more interesting. Now, latest reports reveal that Balayya, upon been asked by the inquisitive Telangana CM KCR, told him that his 100th film will indeed be Aditya 999, a sequel to his yesteryear classic Aditya 369. Balayya reportedly told KCR that he will commence the film very soon. Earlier today, Balayya met KCR to request him to grant the Building Regularization Scheme for Basavatarakam Cancer Hospital. Also, Balayya reportedly requested KCR to watch Dictator, to which the Telangana CM obliged.